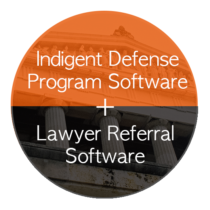 Following the success of our LRS software we have now released our Indigent Defense Program Software. This Module was designed to seamlessly blend with our Lawyer Referral Software allowing the Referral Service to easily manage these programs for the Courts. Complete Indigent Defense, Bench or Bar Assignment. Allows Court Staff to Review Upcoming Calendars and Assignments. Online Case Reporting and Billing Portal. Create and Manage your own Court Calendars. Online Attorney Reporting of Case Hours Worked and Expenses Tracking. Rules Driven Hourly Billing Based on Case Type. Includes Billing and Reporting for Private Investigators and Special Witnesses etc. Email Notification of Court Dates or Case Assignment for Attorney.